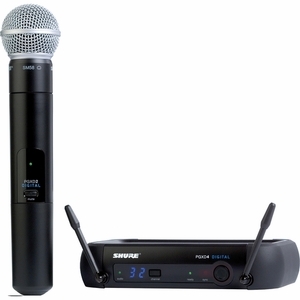 This system includes the receiver, handheld microphone transmitter with SM 58 capsule. The receiver operates over a stable 900 MHz bandwidth. The result minimizes noise and RF interference. The rear panel features XLR and 1/4" phone outputs. Its Scan & Sync feature automatically sets up the transmitter and receiver for stable operation.